(Just What the World Needs) Another Blog...: What Offense? This cartoon, accompanying Gene Weingarten's "Beyond the Beltway" column in today's Washington Post magazine, prompted a pre-emptive apology from The Post. The paper wants to be sensitive about last week's incident in which a chimpanzee attacked and severely injured a woman in Connecticut. And, of course, there's the mini-controversy over a recent New York Post cartoon showing two cops standing over a dead chimpanzee. "They'll have to find someone else to write the next stimulus bill," one cop says to the other. The Rev. Al Sharpton saw that as an attack on President Barack Obama, given the fact that the stimulus bill was Obama's first legislative accomplishment and--as Sharpton put it--"the historic racist attacks of African-Americans as being synonymous with monkeys." Grammar aside, if you try hard enough, I suppose you might see the point the Rev. Al's trying to make. Still, couldn't it be the cartoonist just thought the stimulus bill so bad it could have been written by a monkey? And maybe it's just that I'm a former book reviewer, with a tendency to over-think symbol and metaphor, but I wonder whether he had in mind that old adage about a million monkeys on a million typewriters coming up with Hamlet, given enough time. But I just don't get the fuss about the cartoon accompanying Weingarten's column. In fact, I'd skimmed it Sunday morning and decided not to read more because it featured his "friend Gina Barreca, the feminist scholar." I don't find her particularly funny. Before concluding that "[w]e regret the lapse," The Post's Editor's Note says "[i]n addition, the image and text inadvertently may conjure racial stereotypes that [the paper] does not countenance." What racial stereotypes? 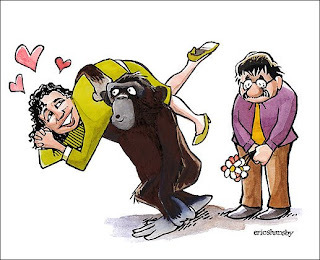 I see a monkey--excuse me, an ape--carrying away a woman who appears to be blissfully happy. Perhaps the editors should have been more concerned about the position of the (wilting?) flowers in Weingarten's hand. Ha-ha - that last line is a good one! Wish I'd Written This. . .